Film enthusiasts, sci-fi nerds, architects, and romantics alike will delight in the provocative new exhibition at the GSAPP’s Arthur Ross Architecture Gallery. Titled Liam Young: New Romance, it features three remarkable films that explore how technology is changing society and the built environment. New Romance is the product of a collaboration between director Liam Young (an Australian architect-turned-filmmaker) and writer Tim Maughan (a British fiction and non-fiction writer). The exhibition features three films that extrapolate current trends in technology to create near-future sci-fi settings; each film tracks a different kind of romance to explore how technology might shape human relationships and architecture. For instance, In the Robot Skies follows the relationship between two teens—Jazmin and Tamir—living in public housing in London. One teen is under house arrest, so the pair uses hacked drones to pass notes between one another. Shot entirely from the drones’ perspectives, viewers see a familiar story of star-crossed lovers from an entirely new vantage point. The striking Where the City Can’t See was shot entirely in LIDAR, a technology used to scan surfaces for digital mapping and navigation. It follows Dexter, a new arrival to Detroit, as his factory coworker Kelis takes him into a community of young people who shield themselves from the city’s smart sensing technologies. Hidden from Detroit’s electronic eyes, they gather to dance, party, and freely express themselves. Lastly, Renderlands explores the fantasy life of Prakash, who works at an anonymous Indian render farm. Prakash uses leftover fragments of digital renderings to build the image of his dream girl, an unnamed American actress, who he meets in a romanticized digital vision of L.A. A peon by day and dreamer by night, Prakash constructs a digital fantasy alternative reality. All three films offer beautifully surreal visuals and a soundtrack by Detroit-based D.J. Stingray to match. However, Young and Maughan contend that these films don’t depict dystopias in the conventional sense: these worlds are extrapolations of the “trends and weak signals” the duo have already detected in the real world, especially in parts outside the developed West. As Young put it in a panel discussion before New Romance‘s premier, he and Maughan seek to “embed critical ideas about the present in fiction.” The films use romance as a means to “find the emotional potential and drama in the everyday,” making the work more accessible to a general audience in the process. Liam Young: New Romance runs through May 13, 2017, at the Arthur Ross Architecture Gallery at Columbia University. 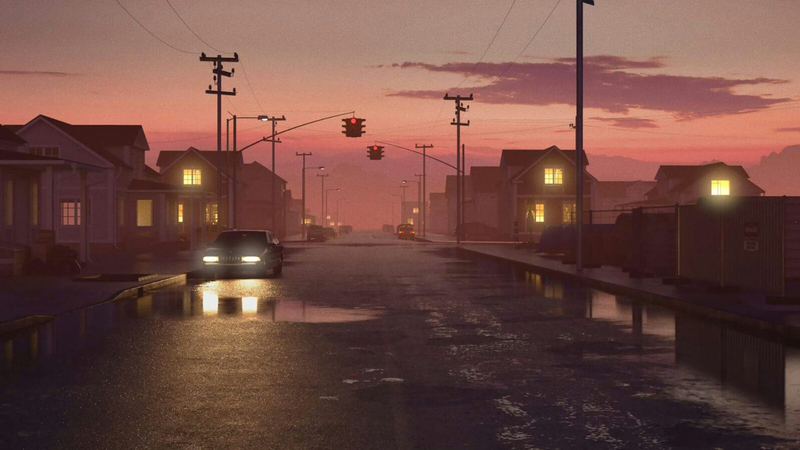 For more on Young, whose previous projects include New City series, matte animations that explore similar near-future worlds, see his Vimeo page here. More on Maughan (who also contributed to the New City series) can be found here.